I’m the type who loves rainy weather. I love when the clouds hang low, grey skies, and misty conditions. So our days in Oslo were fantastic. It would have been nice to see blue sky once while we were there to see the fjords more, but we can’t have everything. 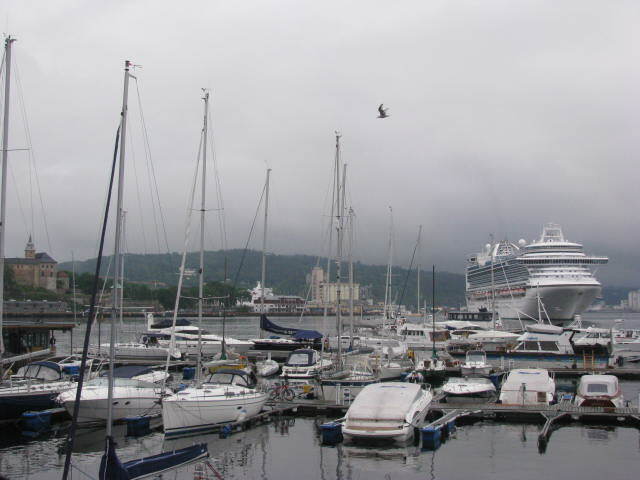 This entry was posted in Travel Photos and tagged 50 Year Project, Boats, Cloudy Days, Europe, Fjords, Grey Skies, Nature, Norway, Oslo, Photography, Rainy Weather, Travel Blog, Travel Journal, Travel Photo. Bookmark the permalink. I love grey sea port scenes. Loving your photos and exploits, so interesting. Glad you are having fun. Thanks for following my blog as well…do stop by again soon and say hello…lovely to hear from you. I am following you with anticipation of what you will post next. Have a great week. Thanks…I’ve been so busy lately that I haven’t as much reading time. That’s frustrating. I know I have the same problem and when I try to write I cannot concentrate long. Too much writing of our own I expect. Norway! Fantastic memories! One of the most beautiful countries I have ever visited. You are not the only one who likes rain and mist. I wonder how this looks in black and white! I fell in love with Norway. It is one of our faves. The landscape is so beautiful. The people were super nice and I loved the feel of Oslo. Such a fantastic place! You must have lived this week then? I did and I’m loving this morning. I think since I grew up were it hardly ever rained, now I can’t get enough. Well that isn’t true. Last April when it rained and rained and rained, that got to be a little much. What a great variety of boats here, from the small sailboat to the large cruise ship! Nice shot! It was funny to see the large cruise ship behind all the tiny boats. At least they looked tiny compared to that one. It is best in moderation. Thanks! It does add to the mood. London is perfect for you, then. 🙂 I need sunny skies, so I’m in the right place too. I so want to see Norway one day–my grandmother came from there. Often the misty moments are the most inspiring ones. Yes! And I always want to curl up with a good mystery. I love grey skies and misty weather too. Everything feels mysterious, like there are stories with secrets waiting to be discovered. I think it’s good to be able to appreciate and enjoy rainy weather. I love the sun too, but I guess different days have different moods that go with them. I can appreciate that. I love all types of weather, except wind. I can’t seem to get away from wind though. I get that way sometimes. When I’m snuggled down for the day with a good book and the mood is just right, the sun better not come out. I love rainy weather too – wild, crazy weather, actually. But I don’t like it when that’s the only season. Yet, when I see people in the middle of a typhoon, just holding onto a pole or something, I SO understand! Yes…some of those images of typhoons and hurricanes are terrifying and I don’t want anyone to experience those. That’s a strange sentence to type, I know… But I love the rain, so what can I say? Beautiful and serene! It rained yesterday and I felt like staying home, watching t.v., playing with my son, sipping a hot delicious soup but unfortunately, I had to work. I also enjoy weather like this although I kind of adore sunny days. Have a great weekend. Looks like a storm might be brewing. There was a little rain, but not much. It poured the next day though which was awesome! Glad you enjoyed Oslo. Meanwhile, that looks like a Royal Caribbean ship to me. That’s a pretty good guess. I wish you many sunny days Nia. I prefer sunny days. Too many gray, rainy days tire me out. I’m usually not a fan of bad weather (especially on weekends), but I do like the odd ominous cloud cover and thunderstorm during an evening. That photo is exactly what I’m talking about. It’s dull, but not in the sense that it depresses you. Thanks Wes. Why does the bad weather always seem to strike during the weekend? That drives me crazy. That’s always the way, isn’t it? We have nice weather throughout the week when we’re at school and work, and then the weekend is bad. For a dreary day, you definately captured the beauty. Nicely done 🙂 The sun is shining here. So hot! It’s raining here and I’m loving it. Stay cool. All is well! Thanks Jo. One of my friends from the States was visiting and we’ve been busy having fun. Now back to work and my normal routine. Thanks! I would love Seattle. I haven’t spent much time in the Pacific Northwest, but I hear it is beautiful and I’m hoping to explore it more in the future. Enjoy the lovely fall weather.